On March 23, 2018, the Consolidated Appropriations Act, 2018 (or simply “the Omnibus”) became law, providing funding for the federal government for the remainder of the Fiscal Year (FY), through September 30, 2018. Included within these appropriations were funds allocated for Internet freedom, as detailed in the appropriations bill for the Department of State, Foreign Operations, and Related Programs. For FY18, Congress called for a total of $55.5 million for “programs to promote Internet freedom globally,” representing a $5 million increase to the total earmark. $13.8 million of that total was designated for the Broadcasting Board of Governors (BBG), the federal agency through which OTF’s funding is appropriated. In addition, and as was the case in FY17, an additional $1.2 million was allocated directly to Radio Free Asia to cover personnel costs associated with OTF. This language again formally recognizes the ongoing work of the OTF program while ensuring the timely release of program funding. 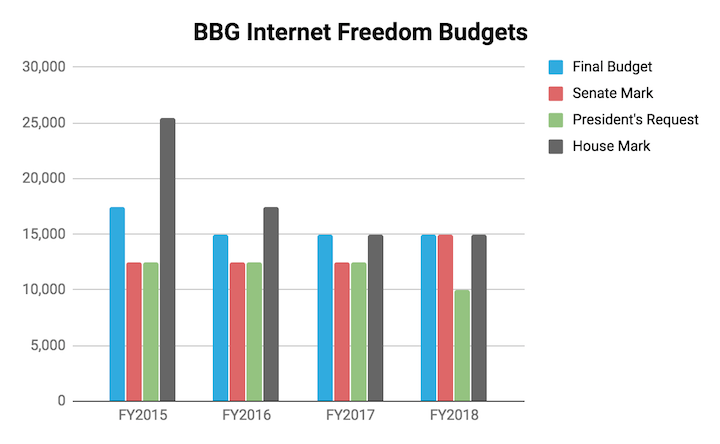 In total, the $15 million ($13.8 + $1.2) allocated to the BBG and RFA is consistent with the BBG’s Internet freedom funding allocation in the previous two fiscal years, when it was also $15 million. Also like last year, the final BBG Internet freedom figure matched that put forth by the House of Representatives, while this year marks the first time that the same number was also put forth by the Senate, as seen in the chart below. The portion of Internet freedom funds ultimately allocated to OTF are derived from those appropriated to the BBG. In FY17, for example, OTF received $8.4 million - slightly more than half of the BBG’s $15 million Internet freedom budget. The exact portion of BBG Internet freedom funding allocated to OTF for FY18 has not yet been finalized, but we will be sure to provide an update here when that figure is determined. We look forward to utilizing this funding, much in demand, by supporting efforts working to advance Internet freedom in the world’s most repressive environments. Indicative of the rising demand for the creation of such technologies and support, in just the first two application rounds of calendar year 2018 we have already received more than 280 concept notes requesting nearly $60 million in support - our two highest rounds ever, back to back. If you work with a project or are an individual working on novel anti-censorship, circumvention, digital security, privacy enhancement tools, or otherwise combating the rise of repressive Internet censorship and surveillance, we encourage you to explore our available funds, fellowships, and labs, and apply if you think you’d be a good fit.